The Korg Monologue Monophonic Analog Synthesizer makes fully programmable, analog synthesis available to all. Featuring a 100% analog sound engine, 25-key velocity sensitive keyboard, masses of control and connectivity for the modern studio and stage, the Korg Monologue packs in endless musical creativity at an incredible price. The Monologue also sports a completely new filter, modulation, drive, and LFO for you to play with too. This monophonic beast delivers stunning power at the hands of redesigned envelope section, modulation routing and a filter that delivers ear-splitting low end punch. This distinctive circuitry can produce incredibly complex overtones resulting in a very aggressive sound (when required). Everything from sharp, punchy leads to massive fat bass-lines can be hammered out with incredible ease. To play the epic sound engine of the Korg Monologue, you get a 25-note velocity sensitive keyboard that covers E - E note range so that any musician can immediately pick up and play phrases, but equally people with less playing experience can also get some superb results with very little musical knowledge. The Monologue's step-sequencer has also been enhanced to give you complex rhythmical patters whilst remaining easy to program. The step sequencer is capable of real time recording and easily overdubbing too so you can play your sequences in freely rather than having to upset your creative flow with programming menu's. The motion sequence function lets you record up to four knob movements which can time-shift and warp sounds in real time. This can create complex patterns that will be completely unique to you. Such a feature can create full drum pattern from a single program. Other functions to manipulate your sequences include slide, real-time transposition and portamento. The Korg Monologue may have an analog heart, but it was designed to function effortlessly alongside any cutting edge equipment. Full MIDI/USB and audio sync connectivity are all present, so no matter if you're on stage or in the studio, the Monologue is ready to work as part of a team. For those random jam sessions, the Monologue can run from 6 x AA batteries so you can play it absolutely anywhere, anytime! Korg have decades of groundbreaking synth technology under their belt and never fail to innovate. 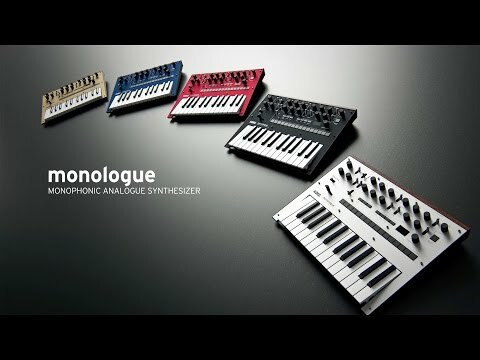 The Monologue Monophonic Analog Synthesizer may be small, but the sound that you will get out of out is nothing short of staggering. Dimensions (W x D x H) 350 x 276 x 76 mm / 13.78" x 10.87" x 2.99"
Weight 1.7 kg / 3.78 lbs.